NASA's Nuclear Spectroscopic Telescope Array, or NuSTAR, has snapped its first test images of the sizzling high-energy X-ray universe. After deploying its mast, the NuSTAR observatory began a series of checkout procedures. NASA's Nuclear Spectroscopic Telescope Array, or NuSTAR, has successfully deployed its lengthy mast, giving it the ability to see the highest energy X-rays in our universe. NASA's Nuclear Spectroscopic Telescope Array launched into the morning skies over the central Pacific Ocean at 9 a.m. PDT Wednesday, beginning its mission to unveil secrets of buried black holes and other exotic objects. The observatory, which will hunt for black holes and other exotic objects using specialized X-ray eyes, will be launched from a Pegasus XL rocket carried by an Orbital Science Corporation L-1011 "Stargazer" plane. NASA's Nuclear Spectroscopic Telescope Array, or NuSTAR, and its rocket flew above the palm trees to arrive at their launch location at the U.S. Army's Reagan test site at Kwajalein Atoll. NASA will host a news teleconference at noon PDT (3 p.m. EDT) June 11 to discuss the upcoming launch of its Nuclear Spectroscopic Telescope Array observatory, scheduled for no earlier than 8:30 a.m. PDT (11:30 a.m. EDT) June 13. NASA's next observatory is about the size of a refrigerator, but it is expected to uncover some of the most powerful structures in the universe. NASA's Nuclear Spectroscopic Telescope Array, or NuSTAR, is now perched atop its Pegasus XL rocket, strapped to the plane that will carry the mission to an airborne launch. NASA's Nuclear Spectroscopic Telescope Array, or NuSTAR, is being prepared for the final journey to its launch pad on Kwajalein Atoll in the central Pacific Ocean. NASA will hold a news conference on Wednesday, May 30 at 10 a.m. PDT (1 p.m. EDT) to discuss the upcoming launch of the Nuclear Spectroscopic Telescope Array, a mission to hunt for black holes. Final pre-launch preparations are underway for NASA's Nuclear Spectroscopic Telescope Array, or NuSTAR. The mission, which will use X-ray vision to hunt for hidden black holes, is scheduled to launch no earlier than June 13 from Kwajalein Atoll in the Marshall Islands. The planned launch of NASA's Nuclear Spectroscopic Telescope Array mission has been postponed after a March 15 launch status meeting. The launch will be rescheduled to allow additional time to confirm the flight software used by the launch vehicle's flight computer will issue commands to the rocket as intended. The Tuesday, March 13, media briefing to discuss the upcoming launch of the Nuclear Spectroscopic Telescope Array has been postponed. NASA will hold a media briefing at 9 a.m. PDT (12 p.m. EDT) on Tuesday, March 13, to discuss the upcoming launch of the Nuclear Spectroscopic Telescope Array. Technicians at Vandenberg Air Force Base in central California are placing the two halves of the rocket nose cone, or fairing, around NASA's Nuclear Spectroscopic Telescope Array, in preparation for its launch. NASA's Nuclear Spectroscopic Telescope Array is being mated, or attached, to its Pegasus XL rocket today at Vandenberg Air Force Base in central California. NASA's Nuclear Spectroscopic Telescope Array, or NuSTAR, mission arrived at Vandenberg Air Force Base in California this morning after a cross-country trip by truck from the Orbital Sciences Corporation's manufacturing plant in Dulles, Va.
NASA's Nuclear Spectroscopic Telescope Array, or NuSTAR, shipped to Vandenberg Air Force Base, Calif., on Tuesday, to be mated to its Pegasus launch vehicle. Why Won't the Supernova Explode? 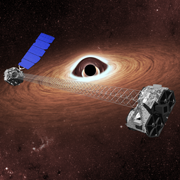 After it launches in 2011 aboard a Pegasus rocket, NuSTAR will give scientists an unprecedented view of high-energy X-rays coming from supernova remnants, black holes, blazars, and other extreme cosmic phenomena. NASA recently confirmed that the Nuclear Spectroscopic Telescope Array, or NuSTAR, mission will launch in August 2011. NASA has made a decision to restart an astronomy mission that will have greater capability than any existing instrument for detecting black holes in the local universe. The selected proposals were among 29 SMEX and eight mission-of-opportunity proposals originally submitted to NASA in May 2003 in response to an Explorer Program Announcement of Opportunity issued in February 2003.